SeniorPooch.com: The URL - We're still a Blogger hosted blog, however, I picked up the SeniorPooch.com domain name and hooked it together. A New Banner - With a little bit of elbow grease and measuring, I updated the banner to allow everyone to see more of the content upon entering the page, by reducing the logo height. 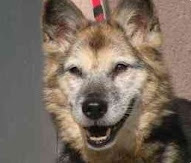 Linked to the Twitter Feed - More on why we needed a Twitter feed later, but the short of it, is that there's a lot of complementary work that I'm starting to do in the Twitterverse in order to get the word out about senior dogs in need. Thanks again for all of your kind words and support. I'm inspired to grow this site into something that makes a difference in the world, while continuing to report on the adventures of Rusty and the other senior pooches that touch our lives.